If you thought I posted the previous Chapter – Unblocking Writer’s Block – just to get a laugh, you’d only be half right. I’ve been sitting here since 11am (it’s now 1.34pm) trying to write something that will make me feel like I haven’t wasted the entire day. I’m having a monumental tussle with writer’s block at the moment. 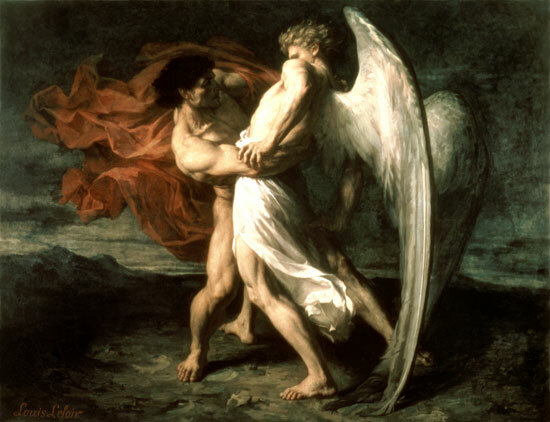 I feel like Jacob, wrestling with the angel. Who’s going to win? I sat down determined to write at least 500 words of my novella. Instead, I wrote about 15 then found myself surfing the net for movie bloopers and trivia. (I’m a sucker for that sort of thing.) Before I knew it an hour had passed. Next, I checked my email and then left the screen up. Bad idea. I kept pushing the Send/Receive button every few minutes: the literary equivalent of kicking a stone round in the front yard, just waiting to see who (if anyone) might drop by. In my case, no-one. Ewwww. Ghastly allusion to aforementioned book unintended. Anyway, to cut a long story short (ironic given the subject of this post), I was looking for any excuse to avoid facing my Goliath. I am at that point in my novella when I’m not sure how to move the narrative forward. All my ideas have dried up. Anything I try seems to jar. Nothing flows. I could swear my characters are wandering around aimlessly on the page, adjusting their trousers and politely clearing their throats. I feel like sitting them all down for a nice cup of tea while I sip something much stronger and ponder what on earth to do with them next. There are two schools of thought on how to unblock writer’s block. A: Get away from your desk. Walk in the garden, ring a friend or – my personal favourite – have a glass of wine and some chocolate in front of rubbish TV. Refresh your brain (yes, even by watching mindless drivel), then come back and try again. I’m not sure which method works best for me. Unfortunately I think it’s the second (so much for lazy days in front of crap telly). Sometimes I find sitting down to write very similar to swimming lengths. At first, your muscles scream with indignation. The first length is hell. You want to give up. You’re panting, your forearms on fire. You reach the end of the pool and cannot believe you have another 19 to go. But if you just keep putting one arm in front of the other, something happens. Very soon (usually on about lap 4 or 5) you realise those arms feel a little less sore. You no longer sound like a hyperventilating, extremely unfit person (even if that’s what you are). You start to think of other things aside from the agony of exercising. And then before you know it, you’re steadily purring up and down the pool, your limbs working in harmony with your body instead of yelling in protest. You reach 20 – and decide to carry on. You only stop because you’re pleasantly exhausted – not because you’ve given up. Writing is the same. Sometimes when I flick on my computer and start to write it feels like I’m dragging every goddamn letter into existence against its will. But most times, after a while, the magic slowly starts to happen. It starts to flow. I get excited. The tapping changes from frustrated intermittent bashing to an optimistic staccato trot, and then, when I’m really in the zone, a steady gallop. Before I know it, two hours have passed and I’ve written 1000 words. So my advice would be – grit your teeth, believe in yourself and your ability, and keep writing though the rubbish. Eventually the gems will start to appear. Look at that. I’ve written a post. Perhaps the juices are finally starting to flow.